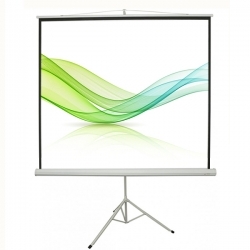 Tripod Projector Screens are a portable solution to any projection need. Tripods use a manual pull up screen, where the casing attaches to a free-standing tripod platform. Popular in schools, because of their mobile design and low cost, tripod are also widely used for mobile business presentations, exhibition, home theater and wedding activity etc. This tripod projector screen is a great mobile solution with a built in carry handle, for those who want a larger image than what a standard mobile projector screen provides. 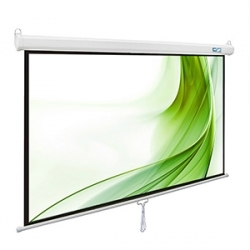 A simple and perfected design which translates into a very robust mobile projector screen at excellent value for money. Adjustable screen height and built in keystone bracket to allow for the very best setup in any environment. Black borders to add contrast and a specially designed 1.0 gain ultra-flat fabric to guarantee an optimum projection experience with every use. This tripod screen is adjustable in its height and available for different aspect ratios (1:1, 4:3, 16:9 formats). The screen has a gain factor of 1.1 and can be used for LCD and DLP projectors. The black back is impervious to light and ensures a perfectly clear projection. Due to the black border, the screen has an increased contrast and the fabric is perfectly flat. Screen Material: Matte white,Matte grey,HD matte white, Fiberglass,Glass beaded etc.